Love the outdoors? Middlebury is a great home base for recreation enthusiasts of every level and interest, including hiking, biking, downhill and Nordic skiing, fishing, rock climbing, canoeing, and kayaking. There’s something to suit every interest, ability and season in the greater Middlebury area. The Trail Around Middlebury (TAM), a footpath over 18 miles long, encircles the village of Middlebury and links several hundred acres of town land, conserved properties, schools, and other local landmarks. Hikers also enjoy the diverse terrain of the 400,000 acre Green Mountain National Forest and Vermont’s famous Long Trail. The Long Trail traverses Vermont’s highest peaks over the entire length of the state, and is renowned for being America’s first long-distance hiking trail. It is accessed by side trails close to Middlebury. Or, a short drive away, explore Moosalamoo’s cliffs, mountain lakes, streams, diversity of plants, and animals, located between Route 125 and Route 73 within the Green Mountain National Forest. The Robert Frost Interpretive Trail, located in neighboring Ripton, commemorates Robert Frost’s poetry with several of his famous poems mounted along the trail in the woods and fields. Addison County has been credited with the best biking in New England, featuring plenty of back roads with beautiful vistas as well as challenging mountain gaps. Five Lake Champlain Bikeways routes pass right through Middlebury, with others beginning nearby and every year, the Vermont Gran Fondo event invites cyclists from near and far to traverse four mountain gaps through the picturesque Green Mountains. Fresh tracks on power days in the afternoon? It’s possible at the Snowbowl, where all day ticket prices are just $35 per day, mid-week. The third-oldest ski resort in Vermont, with all of its original charm, is a family-friendly local treasure. 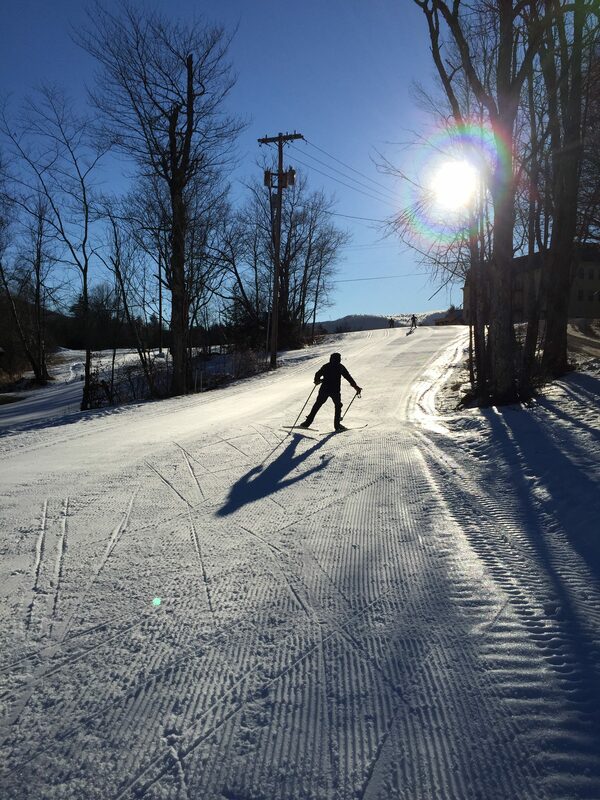 And, just down the road, the Rikert Nordic Center offers 42km of trails for Nordic skiing with state-of-the-art snowmaking equipment to provide world class conditions. Vermont’s numerous lakes, rivers, streams, and creeks conceal many favorite fishing holes, and give kayakers and canoers plenty of waterways to explore. Locals and visitors alike take advantage of the area’s beautiful forests to camp, rock climb, watch for birds and other animals, or just enjoy the peacefulness of nature. Grab your clubs and take in a round of golf at Ralph Myher, an 18-hole public course owned and operated by Middlebury College. In the winter months, snowmobilers enjoy miles of VAST trails and all of the local walking trails can also be used for snowshoeing. Middlebury offers indoor recreation opportunities as well! Check out Middlebury Indoor Tennis, an indoor tennis facility open to the public with year-round programs and services for all ages, as well as the two local fitness centers Vermont Sun and Middlebury Fitness, both offering a variety of classes and equipment.